Okay, we know it isn’t off-road, but its still damn cool. 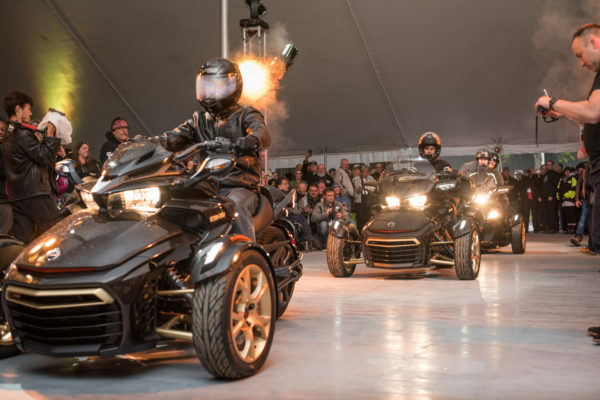 The unique Can-Am Spyder on-road vehicle has defined an entirely new category of vehicle and as testament to its success and to celebrate 10-years of back road twisties, the company hosted a homecoming celebration. More than 3,000 owners from all-over the world descended upon Valcourt, Quebec for a weekend filled with activities. The Can-Am doors were open for the entire group, as BRP invited them all to see the factory, the Design & Innovation Center, R&D facilities, and the company’s powersports museum. There were also guided rides and ongoing entertainment with music, food trucks and more throughout the three-day celebration. In addition, Can-Am unveiled three special-edition models as part of the event.